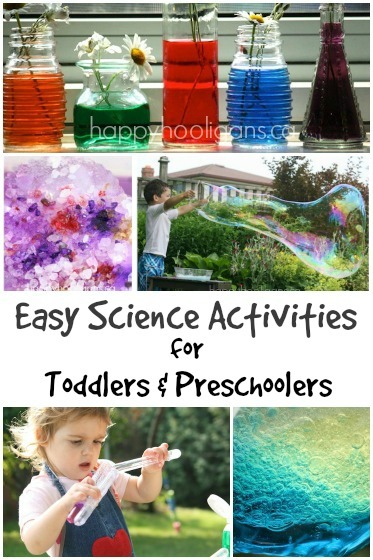 Looking for a fun winter activity for toddlers and preschoolers when it’s too cold to go outside this winter? Bring the snow indoors for this fun and educational snow colouring activity. 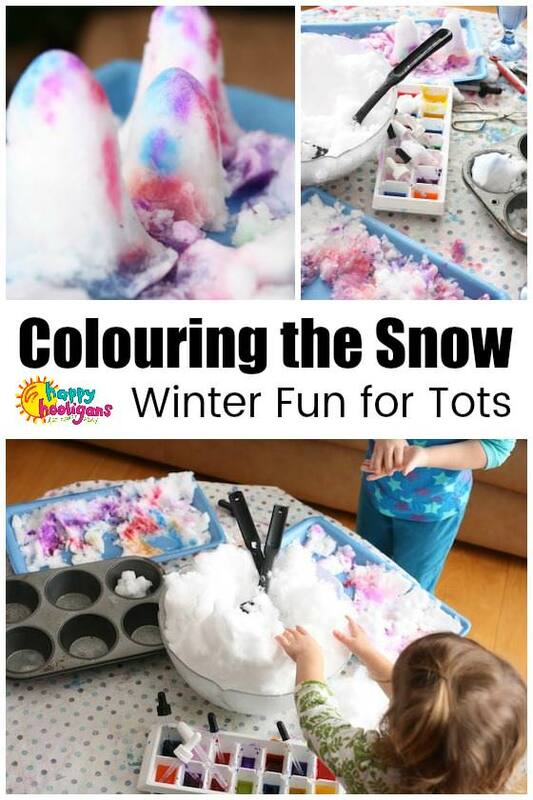 Colouring the snow with water colours and droppers is fun and exciting, and helps young children learn about absorption and colour blending while helping to develop fine motor skills. Plus, it’s just so fun to play with the snow when you’re not all bundled in hats, mitts and snowsuits! I love bringing the snow indoors for the kids to play with when it’s too cold to go outside. We set out to colour the snow with watercolours today, and my-oh-my, this is definitely a new favourite winter activity here at our house! This idea came to me after making our paint resist thank you cards. 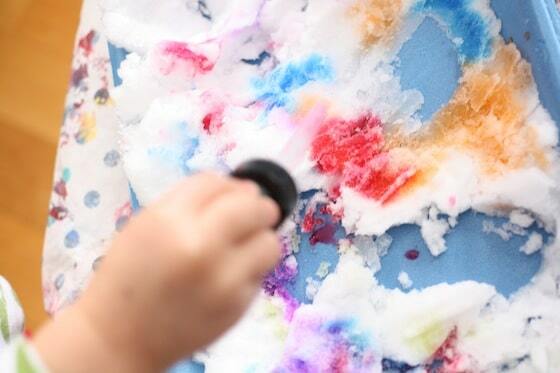 We had some leftover watercolours that day, so we took them outside, and dribbled them over the snow. I didn’t have my camera with me at the time, and I really wanted to share the idea with you, so I decided we would colour the snow again today, and as a real treat, I brought the snow inside, so we could do the activity in comfort. 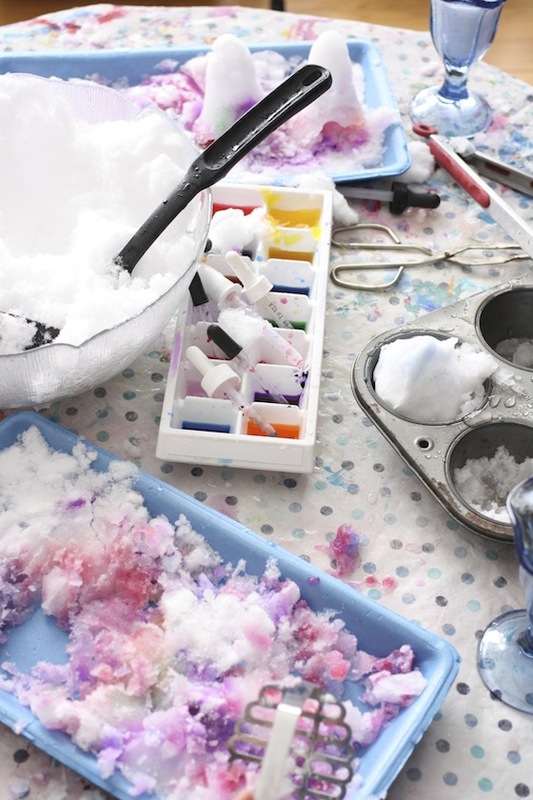 Bringing a container of snow inside is such a great way to entertain kids in winter when the temperatures are too cold to get outdoors. This activity held the hooligans attention for well over an hour this morning. I actually had to fill the bowl up 3 times because they were having such a good time with it. 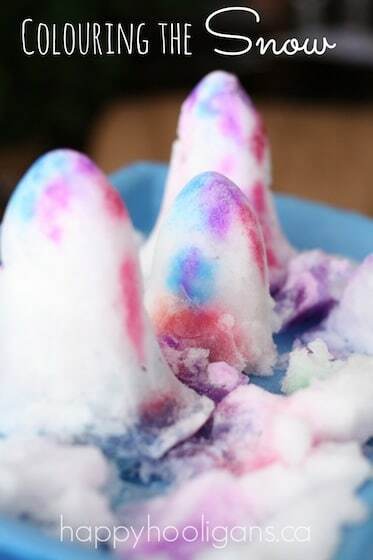 It’s really fun for kids to play with snow indoors in the winter time. 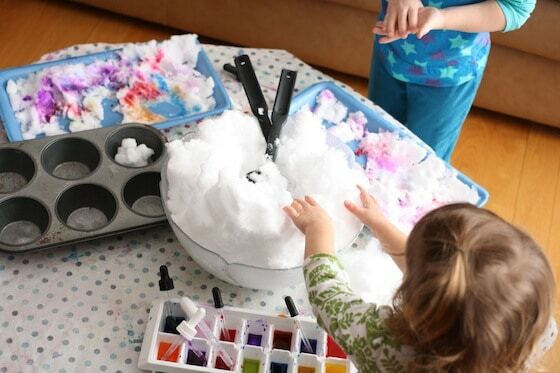 We do it every year, either making a snow sensory bin or a snowy activity bin. 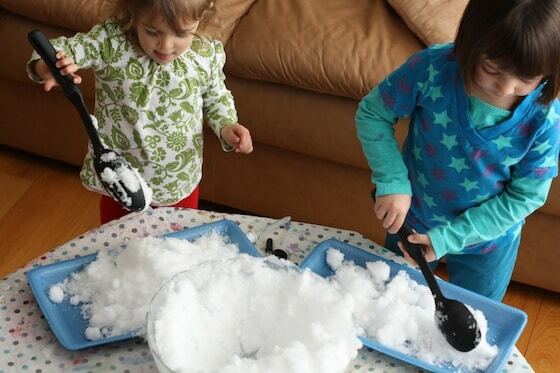 When you bring the snow inside for play, kids have the opportunity to really explore it with their bare hands, in a way that just isn’t possible when they’re outside in freezing temperatures. 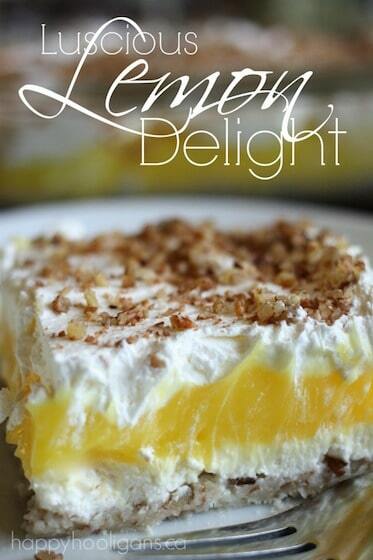 You’ll be surprised at how long the snow lasts when you bring it inside too. The consistency of the snow will gradually change from light and fluffy to wet and heavy, which is a great science lesson in itself, but it takes a long time to actually melt. I’m going to let Deep Space Sparkle tell you what liquid watercolours are because she does it so well in this article. In a nutshell, they’re AWESOME! 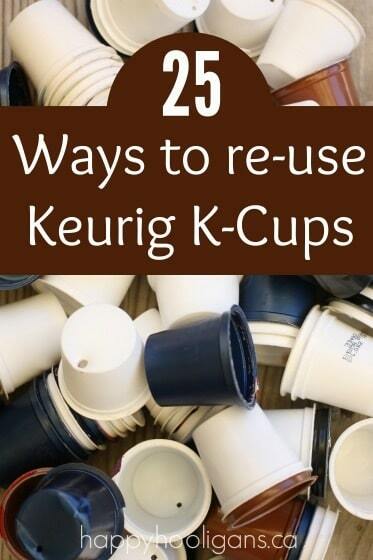 I bought mine off Amazon.com back in the fall, and I LOVE them! Until then, I had always used Wilton Icing Colors and water when we’ve needed intense colour, but I love our liquid watercolours because while the colours are just as intense as the icing gels, they’re non-staining and washable! Then I brought in a big bowl of fluffy, new-fallen snow, and I presented each of the girls with a styrofoam produce tray (previously sterilized in the dishwasher), a large spoon and some medicine droppers. The girls immediately filled their trays with snow, and without any instruction at all, they tapped and patted it all down flat. 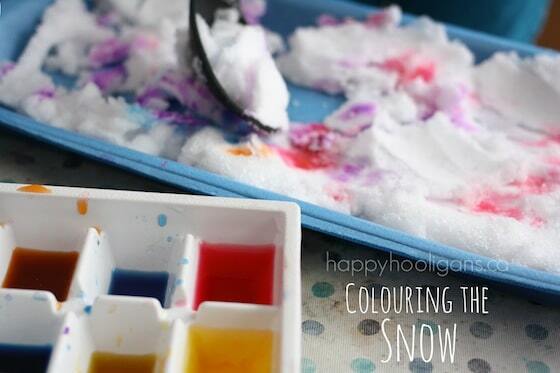 Then I demonstrated how to drip the coloured water onto their snow, and the fun began. They dripped those watercolours all over their trays. The 2 year old was content to pat her coloured snow down for ages. She stood there banging and chopping at it with her spoon for 5 or 10 minutes before getting back to the water colours. A couple of times, they ran out of their paints, so I put more in their ice cube tray, and twice, there was a call for more snow. And after a while I decided to add some more tools to the table. A muffin tin, a potato masher, some tongs, some tall ice cream glasses and an ice cream scoop put a new spin on the activity. The girls worked together to fill and decorate the muffin tin, and they make snow “castles” which they dripped colour all over. Between the droppers and those tongs, their fine motor skills got a great work out today! 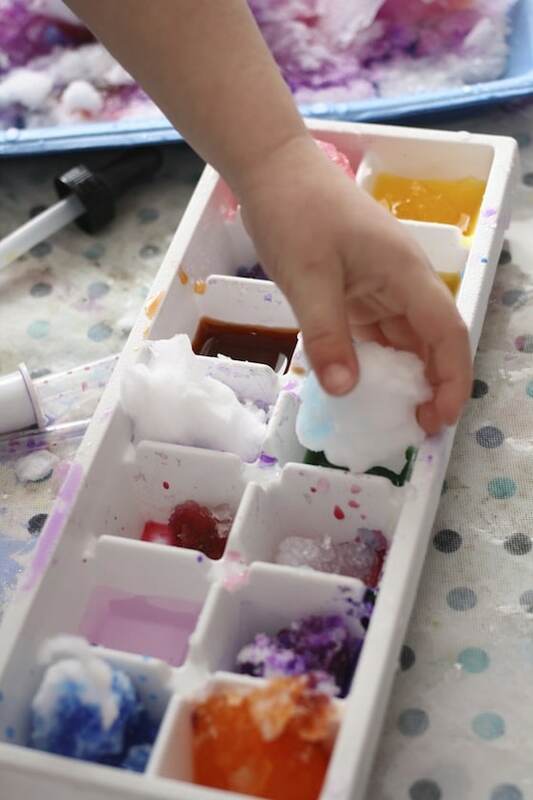 And as the morning play came to an end, they formed small snowballs and dumped them into the tray of watercolours and they were fascinated to see the snowballs “drink up” the colour! 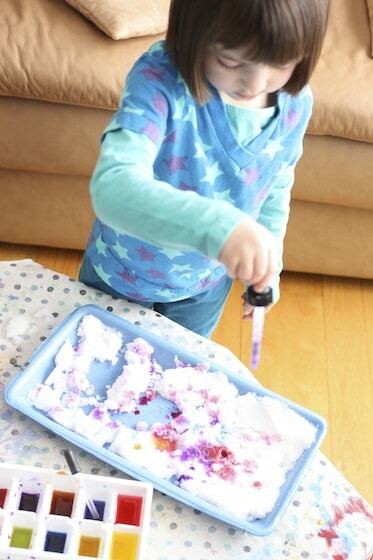 Clean up is a breeze with this activity, as everything just gets dumped into the sink and rinsed off! 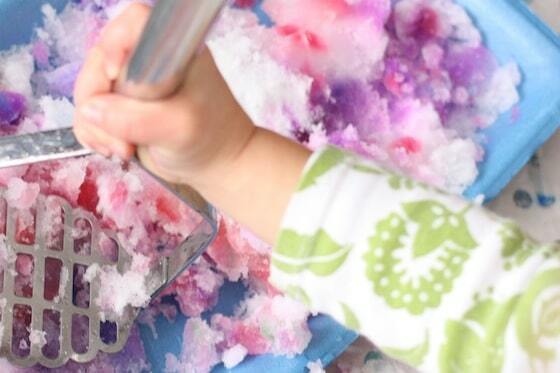 Previous Post: « How to Make a Snow Sensory Bin When it’s Too Cold to Play Outside! Can I come and play one day????? Love this! 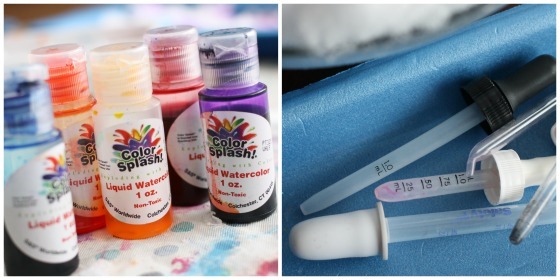 If you haven’t before, you should try it with regular finger or tempera paints…VERY cool! Makes “confetti snow” until things start to melt. My daycare kiddos have all loved it! 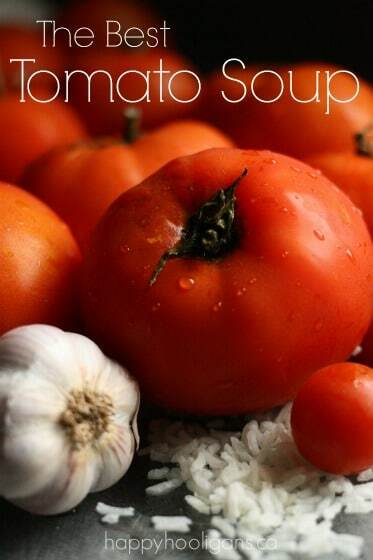 Using juice is a great idea!